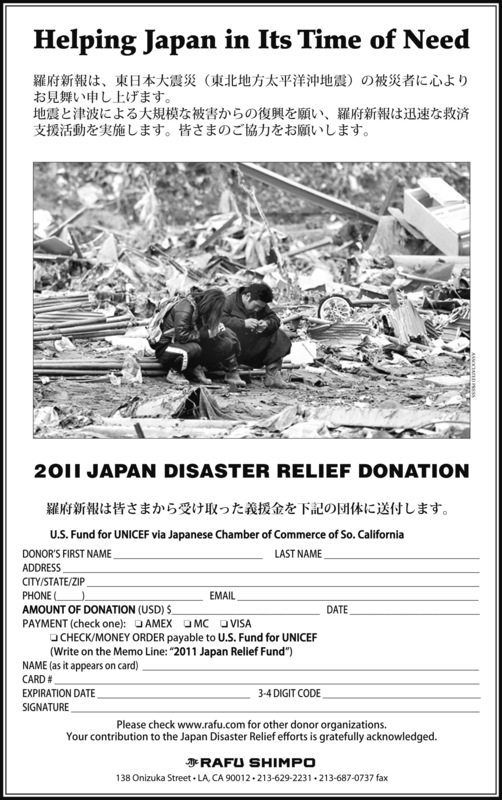 2011 Japan Disaster Relief – We accept credit cards! Comments Off on 2011 Japan Disaster Relief – We accept credit cards! Fill in the form above and ground mail/email/fax to Japanese Chamber of Commerce Foundation 244 So. San Pedro St #410, LA CA 90012, office@jccsc.com or 213-626-3070, or Rafu Shimpo 138 Onizuka St LA,CA 90012. Donations will be sent through UNICEF to children and their families suffer from the Great East Japan Earthquake.